As of 2016 it will become law in the UK that dogs have microchips and also collar tags. Pet microchips are a quick, easy and painless one-off injection which places a tiny microchip under the skin of the scruff of the neck. 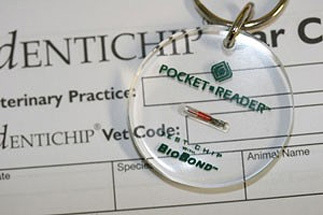 Each microchip carries a unique number which can be read by a portable scanner and will allow the authorities to contact you should your pet become lost. They are small, simple and the best way of ensuring that your pet is returned to you. Should your pet become lost, the microchip system will help to return him/her to you with the minimum of delay, otherwise there is a possibility that they may be re-homed or even destroyed. This is particularly important if your pet is seriously injured. Pets travelling abroad are required to be microchipped as part of the Pet Travel Scheme. Your information is kept for life on our practice computer system and a National Database and the fee for this is included in the cost of the implantation. If your pet is found and its chip number identified, it is a relatively easy matter to reunite you with your pet. The chips comply with the International Standard (ISO) and so can be recognised by scanners abroad. A European reporting system which monitors reactions to microchip implantation has failed to identify any significant problems in the last 6 years. Visit www.identichip.co.uk for more information on pet microchips. Book a pet microchipping appointment for your pet today by calling 01980 621999 or by using the link below to send us a message.